An intelligent agent needs to be both embodied and embedded in the world. Awareness is what is generated through the interaction of the entity with its environment. So the concern is whether we can perform effective behavior at appropriate moments and in the right places. Often consciousness is not necessary for bodies to perform adequately. We can articulate, coordinate and even control situations without being conscious of when and how we are doing it. In fact, we perform successfully because we perform habitually and automatically. So complex behavior is possible without consciousness. (In fact “surprise” is that which happens when our sensory feedback does not match our expectations). Perhaps there would be less of a philosophical dilemma if the word “consciousness” is replaced by “attention”- which seems to occur when we malfunction or face surprising or threatening situations. It is only when the smoothness and seamlessness with a situation is interrupted that awareness or attention is required. When something goes wrong, when something is surprising we need to examine and analyze. So is the experience of consciousness private, phenomenal and emotional? Can we meaningfully say that consciousness resides in individual bodies, that which constitutes agency? Or is what we call consciousness a description of an observable state, of particular and peculiar and subtle behavior? Consciousness should be seen as situational rather than spatial. We need to question such held beliefs that consciousness is stable, unified and coherent. Is consciousness an emergent property of the complexity and organization of the brain? (A brain is not a brain without a mobile and manipulating body). A key to comprehending consciousness is to remember that whatever happens in the brain is to enable the body to perform more effectively in the world. Memory and identity contribute to a consistency of response. Through it’s experience of the world the body is conditioned to suppress or generate appropriate behaviors. What is stored need not be representational. We do not have images and ideas in our heads…. When this person speaks as an “I” this body understands that “I” is a language construct and compression of a complex interaction between this body and other bodies, artifacts and institutions. “I” only designates “this”, “you” only designates “that”. It’s a huge leap of metaphysics to imagine “I” is some inner mind, some inner essence. Baudrillard’s point is that what is important is not arriving at the point where one says “I”, but rather being in the condition where it’s no longer of any importance whether one says “I” or not. Freud, although he considers subjectivity as neither innate nor inevitable, sees the subject as knowable content and that which can be analyzed. Unfortunately, he then splits subjectivity into a conscious and unconscious. And splits the conscious again (into ego and superego). Julia Kristeva sees the subject as merely the hypothetical inside of an imagined container whose walls are permeable. The subject is more a process than a structure. There is an undermining of the Enlightenment idea that bodies possess a free and autonomous individuality. Deleuze and Guattari see the self as consisting of infinite and random impulses and flows, “lines of flight and machine assemblages”. The BwO is a body as a screen, as a surface- a site for random connections and interplays. The body and its subjectivity, the human then is not something considered in-itself, but rather it it’s exteriority. Donna Harraway undermines organic and essentialist models of the human. What is important is not essences and identities, but overlaps and interfaces. In this shift from essence to interface, we need to construct identity and awareness as external. And, of course there is the Post-modern belief that language is that which structures human culture and subjectivity. What this all exposes and undermines is the acceptance of the Cartesian premise that self is a sufficient starting point for the analyses of the world. Self and subjectivity then is primarily an experience continuously being constructed externally, and remains open to change, inconsistency and contradiction. The subject does not define itself, but rather is defined by something outside of itself (the Lacanian mirror-image). And for Lacan, language is the very material of subjectivity. Words like “intelligence”, “awareness” and “agency” are words describing particular and peculiar behaviors performed effectively and appropriately in certain locations and situations. We do not need to imagine that they indicate anything other than that. What is important is not what happens within us, but rather what happens between us- in the medium of language in which we communicate, in the social institutions within which we operate, in the culture within which we’ve been conditioned- at this point in our history, and so on. Depending on our frame of reference. To talk of agency is to refer to an intentional act defined within a very small frame of reference. Nietsche says that “…there is no “being” behind doing, effecting, becoming; ‘the doer’ is merely a fiction added to the deed- the deed is everything”. There is then the problem of the seduction of language. A language whose grammar generates and constantly reinforces imaginary subjects. It is problematic to assume that behind every effect, there is a human subject intending it. In the body performances, the skin has been stretched, the body has been probed and it’s limbs have been extended. The interest is to construct alternate interfaces that explore the absent, the alien, the involuntary and the automated. What is experienced is the empty, the ambiguous and the uncertain. We fear what we have always been and what we have already become. A Zombie is a body that has no mind of it’s own, a body that performs involuntarily. A Cyborg is a body that is part human, part machine- a body that becomes automated. The fear of the involuntary and the automated generates anxieties, uncertainties and expectations that redefine what it means to be human. And invaded by bits of technology the prosthetic body is pierced and penetrated. It is confronted simultaneously by the experience of extreme absence and the experience of the intensely alien. The body experiences itself as an extruded system rather than an enclosed structure. The self becomes situated beyond the skin. It is through this extrusion that the body becomes empty- an emptiness not through a lack, but accentuated by excess. The augmented body is an anaesthetized body with the internet becoming it’s external nervous system. Remote bodies, spatially separated but electronically connected. Obsessions of individuality and free agency become obsolete in the realm of remote interface. Net-connected, the body can be accessed and actuated by people in other places. Stimbod software constructs bodies with Fractal Flesh, telematically scaling-up subjectivity. A body’s authenticity is not due to the coherence of it’s individuality but rather to it’s multiplicity of collaborating agents. What becomes important is not merely the body’s identity, but it’s connectivity- not it’s mobility or location, but it’s interface and operation. Communicating with computers might be enhanced with Embodied Conversational Agents. An actual-virtual communication system. There is a need to engineer Individuated and intelligent avatars that can impart and exchange specialist information (as expert systems)- to facilitate operations in both real-world and virtual task environments. 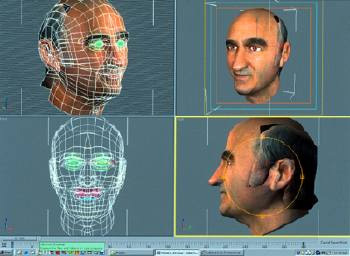 Such avatars, to be effective as interfaces need to not only make the appropriate verbal responses in context-sensitive situations, but also to understand and initiate appropriate behavioral cues and make appropriate emotional expressions. How does the agent indicate it is listening when it is spoken to? Its behavior needs to indicate recognition, comprehension, doubts and disbeliefs. Embodied conversational agents would be more effective with personalities. An agent would need a consistent personality, avoiding distracting or distressing behavior. A sense of appropriate presence becomes important in effective communication. The PROSTHETIC HEAD project constructs an automated, animated and reasonably informed if not intelligent conversational agent that speaks to the person who interrogates it. The Head consists of an IBM text to speech engine with a source code for facial expression and real-time lip syncing, with a modified, customized and personalized Alice chatbot engine. It has a data base and a conversational strategy. It is a 3,000 polygon mesh wrapped with my skin texture. The eyeballs, teeth and tongue are separate moving parts. Effectively, it is a virtual automaton whose head nods, head tilts and head turns as well as eye blinks and changing eye gaze contribute to the personality of the agent and the non-verbal cues it can provide. At present a vocabulary of more extreme expressions is being developed to generate more ambiguous responses. Rather than tag certain facial expressions for certain appropriate responses, it will randomly couple them. For example, it may say something benign but look malicious. Or it might say something sinister but smile. What is also being considered is to map biorhythms to its behaviour- so that the Head might be reluctant in the morning to respond to questions, happy to do so in the middle of the day but it might get fatigued in the evening. Imagine also that the Head will have a vision system that enables it to detect the color of the user’s clothing and analyze the user’s facial characteristics. During it’s conversation it might therefore be able to remark that it likes the red coat you are wearing or to ask why you are looking so sad. This will make it a more disarming and seductive conversational agent, making the conversational exchange more individual and intimate. What would make the Prosthetic Head an actual AI would be if it had the capability of increasing it’s data base from the conversations it has. This is not possible with Alice. It is programmed in AIML (what Richard Wallace calls Artificial Intelligence Mark-Up Language).It is programmed in stimulus-response modules. You anticipate the queries, you provide data for its responses. It doesn’t learn from the conversations it has but it is often a very effective conversational system. Embodied Conversational Agents (ECA’s) are about communicative behavior. 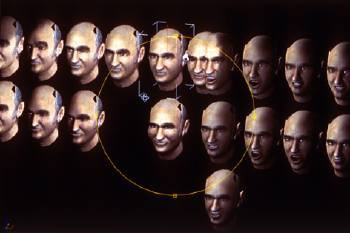 With a vision or sensor system, The Prosthetic Head will also be able to acknowledge the presence and position of the physical body that approaches it. And eventually it will be able to analyze the user’s tone of voice and possible emotional state. Notions of intelligence, awareness, identity, agency and embodiment become problematic. Just as a physical body has been exposed as inadequate, empty and involuntary, so simultaneously the ECA becomes seductive with it’s uncanny simulation of real-time recognition and response. For the TRANSFIGURE exhibiton at ACMI, Federation Square (December 9, 2003- May 9, 2004) the Prosthetic Head was projected as a 4m high head in a black enclosed room that almost makes the Head appear to float in the space just in front of the user. In fact, when the person enters the room the Head is looking at you with its eyes closed. When you approach the pedestal with the keyboard, the Head turns around, opens its eyes and initiates the conversations. The intention was always to use speech recognition so that the person could address the Head verbally. But this proved difficult to do, as there were too many variables for a speech recognition system to manage reliably. So you type in the questions and the Head responds by speaking the answers. One can say that the Prosthetic Head is only as intelligent as the person who is interrogating it. To a large degree, the user directs the conversation. But there are embedded aphorisms and stories that try to elevate the conversation that refer to philosophers like Wittgenstein and painters like Matisse. And the Head does have a repetoire of jokes that it tells- although its laughter can only be of the “ha, ha, ha” variety. I’d like the Head to be more ambiguous and less predictable. To be more informed and less explicit. The Head is capbable of more creative responses with it’s song-like sounds. When you ask the Head to sing a song like “Daisy” or to do some rap songs, it merely speaks the lyrics. But when I was playing with the text to speech engine I discovered that when the Head is asked to say a string or combination of vowels it sounds song-like, chant- like. There is an embedded algorithm that generates different combinations of vowels each time when you ask it to “Sing a song”. In fact, with Chris Coe (Digital Primate) and Rainer Linz (Ontological Oscillators) we’ve recorded a CD titled HUMANOID that features the Prosthetic Head reciting poetry and making singing sounds. As well as algorithms for singing and reciting poetry, we’re working on algorithms for generating more enigmatic answers. That’s not as difficult as it sounds. It might mean simply taking your question and scrambling it’s words. If you asked the Head “what is the meaning of life” it might respond by asking “does life have any meaning”?…. Initially I had to make decisions about it’s data-base and whether it’s a somewhat pathological, philosophical or flirting head. In recent years I’ve had an increasing amount of PhD students requesting interviews to assist in writing their thesis. Now I can reply that although I’m too busy to answer them, it would be possible to allow an interview with my Head instead. A problem would arise though when the Prosthetic head increases it’s data-base significantly, becoming more informed and autonomous in its responses. The artist would then no longer be able to take full responsibility for what his Head says. STELARC- Do you find life uncertain? Karen Marcelo – project coordination, system configuration, alicebot customization. Dr. Richard Wallace – creator of alicebot and AIML. alicebot advisor. Alicebot is a natural language artificial intelligence chat robot. IBM text-to-speech engine used for voice generation. Stelarc is an Australian artist who has performed extensively in Japan, Europe and the USA – including new music, dance festivals and experimental theatre. He has used medical instruments, prosthetics, robotics, Virtual Reality systems and the Internet to explore alternate, intimate and involuntary interfaces with the body. He has performed with a THIRD HAND, a VIRTUAL ARM, a VIRTUAL BODY and a STOMACH SCULPTURE. He has acoustically and visually probed the body- having amplified brainwaves, bloodflow and muscle signals and filmed the inside of his lungs, stomach and colon, approximately two metres of internal space. He has done twenty-five body SUSPENSIONS with insertions into the skin, in different positions and varying situations in remote locations. For FRACTAL FLESH, as part of Telepolis, he developed a touch-screen interfaced Muscle Stimulation System, enabling remote access, actuation and choreography of the body. Performances such as PING BODY and PARASITE probe notions of telematic scaling and the engineering of external, extended and virtual nervous systems for the body using the Internet. Recently for Kampnagel, he completed EXOSKELETON – a pneumatically powered 6-legged walking machine actuated by arm gestures. 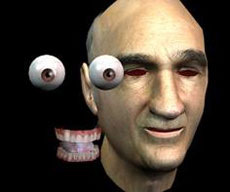 Current projects include the EXTRA EAR- a surgically constructed ear as an additional facial feature that coupled with a modem and a wearable computer will act as an internet antenna, able to hear RealAudio sounds and MOVATAR- an intelligent avatar that will be able to perform in the real world by possessing a physical body. It will have a sound feedback loop from the body giving the virtual entity an ear in the world. He is also working on an EXTENDED ARM – a manipulater with eleven degrees-of-freedom that extends his arm to primate proportions and a MOTION PROSTHESIS – an intelligent, compliant servo-mechanism that enables the performance of precise, repetitive and accelerated prompting or programming of the arms in real-time. 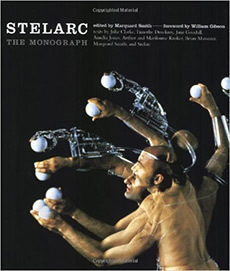 In 1995 Stelarc received a three year Fellowship from The Visual Arts / Craft Board, The Australia Council. In 1997 he was appointed Honorary Professor of Art and Robotics at Carnegie Mellon University. He is presently Artist-In-Residence for Hamburg City. In 1999 he was re-appointed as a Senior Research Scholar for the Faculty of Art and Design at the Nottingham Trent University. His art is represented by the Sherman Galleries in Sydney.